GEDI has the highest resolution and densest sampling of any lidar ever put in orbit. 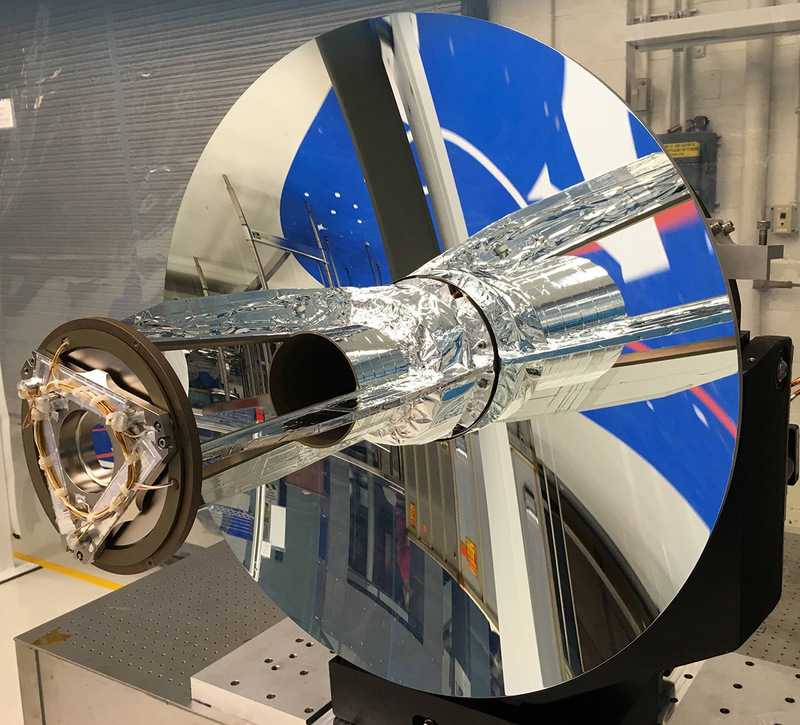 This has required a number of innovative technologies to be developed at NASA Goddard Space Flight Center. GEDI is a full-waveform lidar instrument that makes detailed measurements of the 3D structure of the Earth’s surface. Lidar is an active remote sensing technology (the laser version of radar) which uses pulses of laser light to measure 3D structure. The light is reflected by the ground, vegetation and any clouds and is then collected by GEDI’s telescope. These photons are then directed towards detectors, converting the brightness of the light to an electronic voltage which is then recorded as a function of time in 1 ns (15 cm) intervals. Time is converted to range (a distance) by multiplying by the speed of light. The recorded voltage as a function of range is the full-waveform. 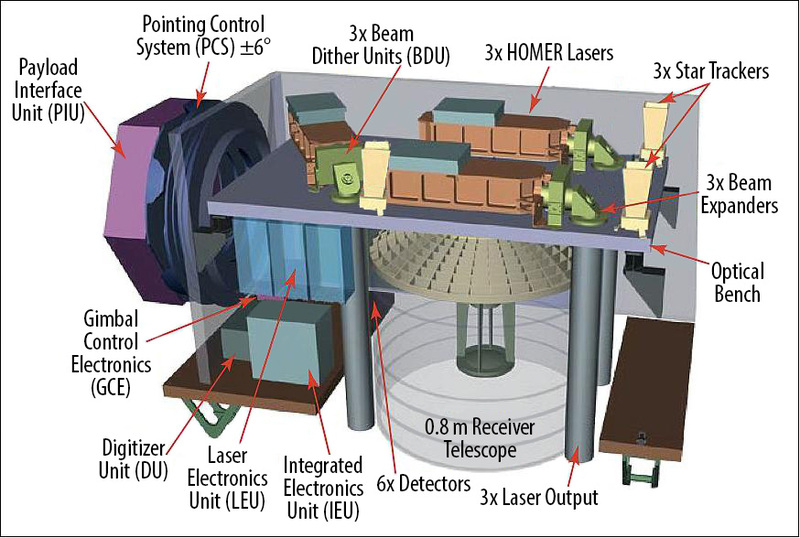 GEDI instrument showing lasers, optical paths, detectors, and digitizers. GEDI’s 80 cm telescope through which received light is collected. GEDI is deployed on the the Japanese Experiment Module – Exposed Facility (JEM-EF). The highlighted box shows the location of GEDI on the JEM-EF. 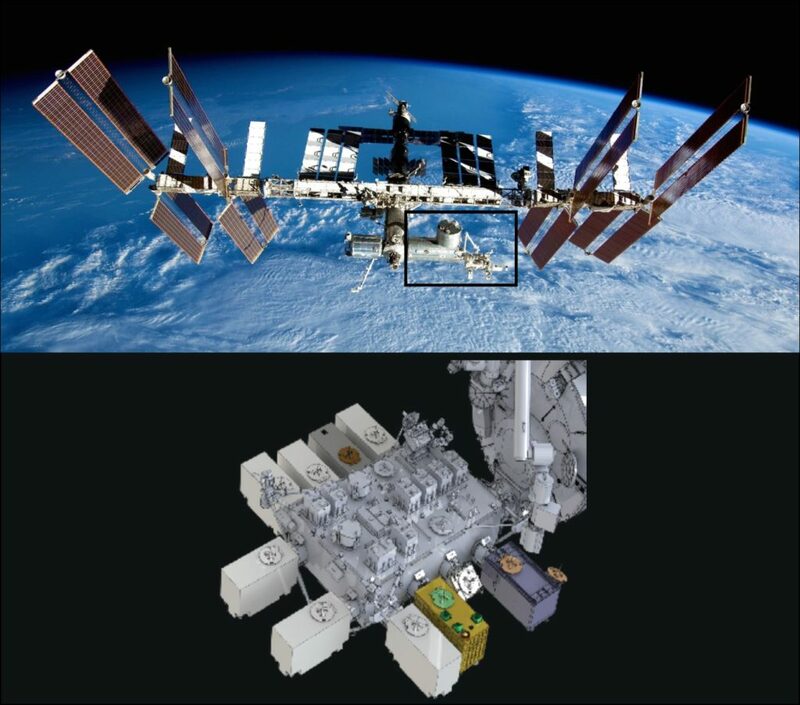 The International Space Station [top] and the Japanese Experiment Module – Exposed Facility [bottom] where GEDI, highlighted in gold, is installed. A GPS system provides knowledge of where the GEDI instrument is in its orbit relative to the surface of the Earth, while star trackers give the orientation of the instrument. This allows the location of GEDI waveforms on the Earth’s surface to be calculated with a horizontal accuracy within +/- 9 m. GEDI minimizes its off-nadir pointing to be less than about 6° to avoid inaccurate range measurements. The sole GEDI observable is the waveform from which all other data products are derived. Signal processing is used to identify the ground within the waveform. The distribution of laser energy above the ground can be used to determine the height and density of objects within the footprint. The view geometry and active use of light by lidar allows the ground to be identified through small gaps in the tree canopy, enabling unsaturated measurements of much denser forests than is possible with either passive optical (such as spaceborne cameras) or short wavelength radar systems. In addition, uniquely amongst satellite remote sensing, the height and vertical distribution are direct measurements than can be compared to field observations. Lidar waveforms quantify the vertical distribution of vegetation by recording the amount of laser energy reflected by plant material (stems, branches, and leaves) at different heights above the ground. From GEDI waveforms, four types of structure information can be extracted: surface topography, canopy height metrics, canopy cover metrics, and vertical structure metrics.